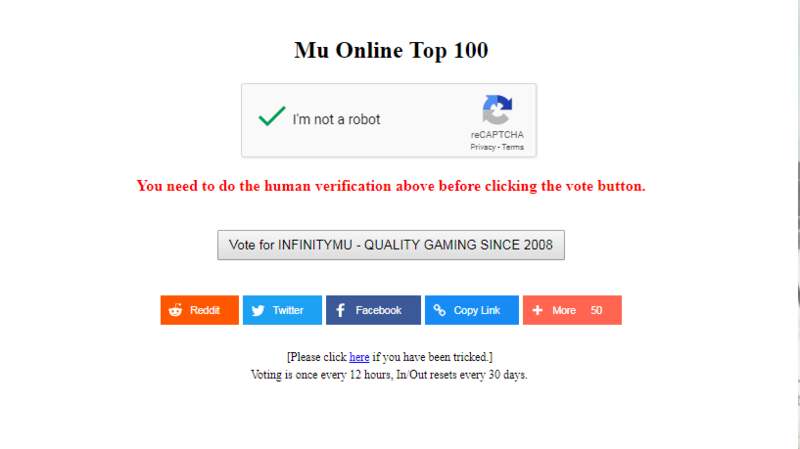 - Make sure to post 2 screenshots, first one showing the captcha code and with the code spelled correctly.Moreover, you have to post one more screenshot which shows the InfinityMU banner on XtremeTop100 and our position there.Both are necessary otherwise your post will be deleted. - DO NOT think to create 2 accounts to vote and win this event.Staff will be checking the accounts and if someone is caught with a second account, both will end up banned.Proxies are not allowed as well! - You cannot post in this thread every hour.This is actually "cheating" to win this event.You can only vote every 12 hours! It's impossible to make 2 posts in 1 hour because your votes won't count.There will be no warnings for this, forum account will be banned for 1 day. - Staff team is allowed to join, excepting Game Masters. - Questions at Questions Section! - Winner will be chosen at the end of the month. - If you've won the previous month, you can't win (but you can participate) the first place prize next month! 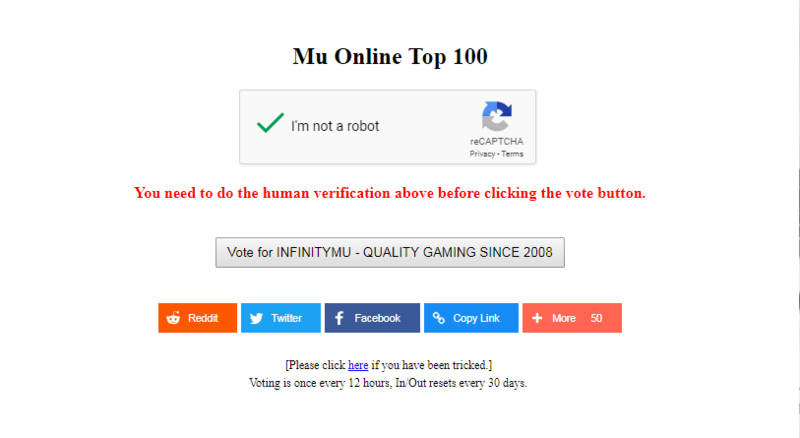 - By voting correctlly you will help our server to come back on Top 10. Cheating results in disqualification and forum account ban for 7 days! Vote every 12 hours guys, good luck! Last edited by Scarlette; 03-01-2019 at 01:18 PM. Last edited by jen4nik; 04-01-2019 at 01:41 PM.